The narrative is alternately moving and heartbreaking, as Latson walks readers through the tumultuous obstacles that Eli and Gayle face daily. Throughout, Latson demonstrates a sharp, journalistic eye for telling detail and the ability to capture poignant moments without resorting to cliché or overly sappy writing ... Refreshingly, Latson does not sugarcoat Gayle’s very real mental and emotional battles as she tries to make her son’s life as fulfilling as possible, and readers will be hard pressed not to empathize with Gayle’s attendant fight to maintain some sense of self ...In this balanced, readable work, Latson effectively and sympathetically captures Eli’s essential humanity and opens a clear window on a little-understood genetic disorder. The narrative that takes up most of the book’s pages is a sensitively drawn portrait of the boy referred to in the title, who is given the pseudonym Eli and whose daily reality Ms. Latson appears to have made an extraordinary effort to get to know ... Long stretches of dialogue—during lengthy car rides, at family gatherings, in counseling sessions—indicate that Ms. Latson had a tape recorder running, or else was a phenomenal notetaker, because the conversation rings true. It also works to let this family tell its own story ... It’s an open question whether we will respond as positively as his classmates did, but Ms. Latson’s book makes a persuasive case that we should try. While Latson’s storytelling is sometimes more dutiful than necessary, her book provides a thorough overview of Williams syndrome, and its thought-provoking paradox. No doubt life for people with Williams (and those who love them) has its difficulties. But given the state of the world today — the hate attacks, the divisiveness, the vitriol — it’s hard not to wish that we all had more kindheartedness and openness, even if our embrace of other humans is only metaphorical. 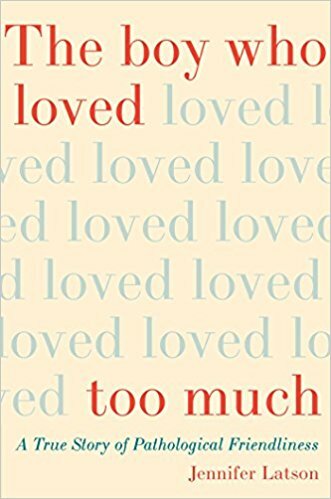 What did you think of The Boy Who Loved Too Much: A True Story of Pathological Friendliness?